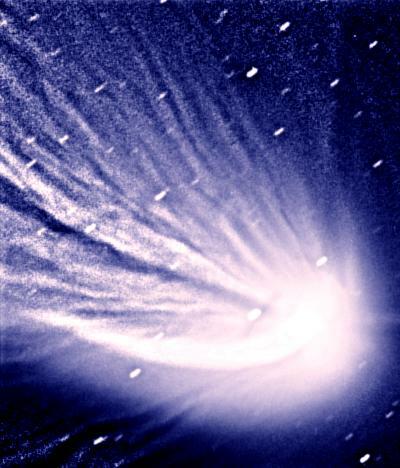 Explanation: This enhanced composite image detailing structure in the coma and dust tail of Hale-Bopp was recorded May 5 - one day before the comet's passage from north to south across the plane of Earth's orbit. As the comet descends into murky twilight for northern hemisphere observers it will become increasingly easy to view from the south. Along with Southern Hemisphere observers, astronomers and a fleet of spacecraft of the International Solar-Terrestrial Physics program have been anxiously awaiting this north/south crossing. 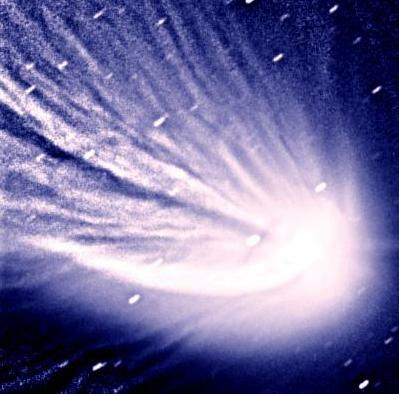 The comet's interaction with the changing equatorial solar wind and magnetic field during this crossing is expected to produce distortions and disconnections of Hale-Bopp's ion tail. Whisker-like structures, probably part of the ion tail, are visible above extending from the lower left of the bright coma.